Edwin Landseer Lutyens was one of England's most prominent and inventive architects working in a traditional manner during the late 19th and early 20th centuries. Edwin Landseer Lutyens was born on March 29, 1869, in London, England, the 11th of 14 children of an army captain who retired from service to study art with the English animal painter Edwin Landseer, after whom the young Lutyens was named. As a boy he wandered the Surrey countryside where he developed an appreciation for the local crafts traditions and a special admiration for the complex interlocking shapes of the vernacular cottages and barns found in the region. At age 16 Lutyens attended the South Kensington School of design to study architecture. He then joined the office of Ernst George (1839-1922), a talented pupil of Norman Shaw (1831-1912). The influence of Shaw, Philip Webb (1831-1915), and the English Arts and Crafts Movement became the foundation for Lutyens' creative career. Upon establishing his own office in 1889, at age 20, Lutyens embarked on a long career that included every kind of commission, from cottage design through commercial and ecclesiastical buildings to town planning. His work can for the most part be divided into three general stylistic categories: Romantic Vernacular, Neo-Georgian, and Neo-Classical. Lutyens established a national reputation early in his career by designing houses for the English nouveau riche in a rambling, picturesque vernacular style derived from Shaw. These houses, like the majority of his work, reveal his mastery of spatial play with rooms flowing together in a loose, coherent manner. His designs are characterized by their incorporation of traditional vernacular styles and an honest use of local materials. An important feature of these houses is their careful integration with romantically conceived gardens, frequently designed in collaboration with the famous garden designer Gertrude Jekyll (1843-1932). In fact, his first major house, Mustead Wood, Godalming, Surrey, was designed for Jekyll, a close personal friend of Lutyens who did much to promote his career. In Mustead Wood, tile roofs come right down to the tops of the doors and large gables with windows that are treated as strips made of oak-framed casements with leaded lights. One of Lutyens' most inventive houses is Deanery Gardens, Sonning, Berkshire (1899), designed for Robert Hudson, founder of Country Life, a magazine to which Jekyll contributed numerous articles. Lutyens created a rambling, picturesque composition with the complex interlocking of architectural elements that characterizes so many of his house designs. His delight in the interplay of spaces is displayed here in the southeastern corridor, which runs straight through the house, becoming partly open and covered passage for the family from entrance to garden. Lutyens, who believed architecture should sometimes exhibit a bit of humor or wit, often exaggerated dominant features such as tall brick chimneys, mullioned windows, and deep gables. Lutyens' Neo-Georgian work, which he jokingly referred to as his "Wrenniassance Style" (after the great English baroque architect Christopher Wren) is typified by the use of English baroque forms and details. Characteristic examples of this stylistic approach include his much copied design for Middlefield, Great Helford, Cambridge (1908), with its symmetrical plan, classical details, sweeping roofs, and tall chimney stacks. The alternating planes of the chimneys, the outer chimney planes projecting outward and reversed for the central chimney, reveal Lutyens' inventive love of form. This same inventive spirit is found in his Neo-Georgian design for Ednaston Manor, Brallsford, Derbyshire (1912). Here the simple brick facade, symmetrically organized with a central pedimented facade that features an elaborate broken scroll pediment for the central doorway, is divided by plain pilaster strips. The carved panels in the coved cornice, placed above each pilaster, create the witty allusion of classical capitals. Lutyens' controlling sense of proportion and organizational principles eventually led him to explore the harmony, strength, and repose of classical design. Counter to the romantic, rambling plans of his earlier houses, Lutyens increasingly began to incorporate a strong sense of balance, symmetry, and order in his designs. Lutyens viewed the manipulation and organization of the classical vocabulary as a great intellectual game to be played by the architect to create unique, individual designs. His first exercise in this Neo-Classical idiom came with the commission for Heathcoate, Ilkley, Yorkshire (completed in 1906). Here the plan is strictly symmetrical—a large central block with two rectangular side wings. Lutyens created a pseudo-Italian villa with smooth grey Gulseley stone walls, red pantiled roofs, and a full range of Roman Doric elements, including columns, pilasters, metopes, guttea, and triglyphs. The crowning achievement of Lutyens' Neo-Classical work is his Viceroy's House (1912-1932) and related planning of the new colonial capital in New Delhi, India. The Viceroy's House is an excellent example of Lutyens' interest in abstract classical design and rich use of materials. The large structure, surmounted by a huge dome, displays slightly battered walls constructed of pink and cream Dholpur sandstone. The design exhibits a strong abstract quality achieved by the organization of mass and geometry rather than through the inclusion of classical details or ornament. Through intense study and thought Lutyens attempted to distill the classical vocabulary down to its pure essence or, as the architect stated, "They have to be so well digested that there is nothing but essence left." This approach to classicism recalls the work of the revolutionary French 18t-century architects Ãtienne-Louis BoullÃ©e (1728-1799) and Claude Ledoux (1736-1806). Lutyens creatively blended particular Moghul features into his monumental design. These include the chattris, or roof pavilions, and the chujjas, or pronounced projecting cornices, which produce much needed shadows. The lower part of the dome is also derived from traditional Indian architecture, being patterned on such monuments as the circular palisade of the Great Stupa at Sanchi in India. Lutyens selected this feature not only for its Indian association but for its grid-like form, which harmonizes with the geometrical basis of the entire design. The dome, therefore, is a hybrid of classical and Moghul emblems of authority producing the desired imperial associations for the British Raj. The interior also displays the architect's sensitivity to the dry, hot climate of the region. Everywhere unsuspected spaces open up to the sky, bringing fresh air and breezes to the interior. Water plays an important role in the interior and exterior, where Lutyens created a formal garden with fountains and radiating paths that blend traditional elements of Moghul design and English garden schemes. Although Lutyens did not study at the Ecole des Beaux-Arts in France, his strictly formal plan for the city of New Delhi reflects basic French planning principles. The city was laid out along a dominant central axis terminating with the Viceroy's House. Radiating avenues connect this central structure with the secretariats, designed by Herbert Baker (1862-1946), which symbolically link the division of power, recalling the formal scheme for Washington, D.C. that inspired it. 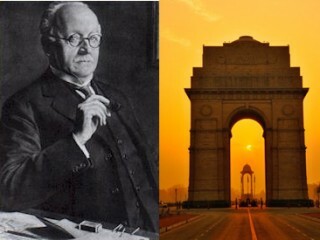 The success of the New Delhi commission led to Lutyens' selection to design memorials for those who died in World War I. Again Lutyens turned to the abstract classical language that he had explored in his New Delhi designs. The greatest of these monuments was the Memorial to the Missing of the Somme at Thiepval near Aaras, France (1927-1932). Lutyens selected the classical triumphal arch as the basis for his design but manipulated this precedent to produce a highly inventive composition. The memorial does not glorify war and triumph, but with its sense of interlocking parts becomes a sublime reminder of the senseless slaughter of the war. The large blank surfaces provided area for the inscription of the names of over 70,000 missing men. Throughout his career Lutyens received numerous awards and honors, beginning with his knighthood in 1918. This was followed by his election as a Royal Academician in 1920 and his award of the Royal Gold Medal for Architecture in 1921. He became president of the Royal Academy in 1938, and when he died on January 1, 1944 his ashes were honorably interred in St. Paul's Cathedral, London. View the full website biography of Edwin Lutyens.